The Center for Continuing Education at Birzeit University, together with the Ministry of Education, organized a workshop to design and develop experiential learning objects – specially-designed interactive lessons that incorporate life skills and active citizenship into school curricula. The workshop is part of the second phase of the Experiential Learning Objects Project, which is carried out with the support of UNICEF. 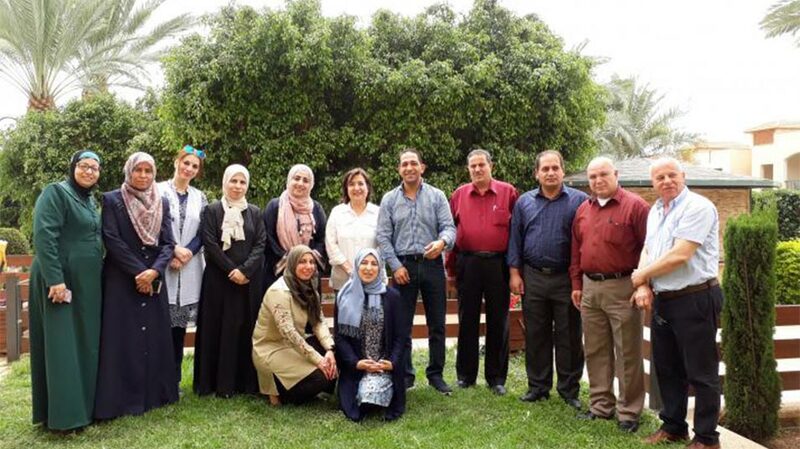 The two-day workshop, held in Jericho, was attended by a team of learning experts from the continuing education center, a number of education advisors from the ministry, and a UNICEF representative. Director of the Unit for Learning Innovation at the Center for Continuing Education Dr. Osama Mimi noted that the current phase of the project will result in 280 newly-developed learning objects for the second and fourth grades. “The project, so far, has trained over 400 teachers in 100 primary schools across all Palestinian governorates on how to use learning objects. The training courses and workshops will also focus on the managerial abilities of school principals and supervisors to further support and bolster learning object development and use ,” said Mimi. Ahed Ayyash, an education supervisor and learning objects coordinator at the Ministry of Education, remarked that the project has helped build the capacities of teachers and supervisors, and has facilitated an interactive, enriching experience for students. Basimah Ahed, the UNICEF representative, applauded the efforts of the learning objects team, saying that the project is a “quantum leap in education quality and life-skills learning.” She added that learning objects create a cooperative environment in which students can produce knowledge, not only passively accept it. Another team from the continuing education center visited a number of public schools in the Salfeet, Qalqilya, Ramallah, and Hebron governorates, together with staff from the Ministry of Education. The team, during the visit, provided support and guidance for participating teachers in the learning objects project. Birzeit University, through learning objects and other similar development projects, seeks to develop the National Bank for Learning Objects, which will serve all grades. The learning objects bank is considered one of the most pioneering learning projects, both nationally and regionally, with hopes that the project can be exported to regional education partners after a successful pilot in Palestine.